Middleweight Felix Sturm regained the WBA middleweight belt with a 12-round unanimous decision against reigning champion Javier Castillejo. Sturm (27-2, 12 KO's) used his defense to hold off Castillejo (61-7, 41 KO's) and win a 116-112, 116-112, 115-113 decision. In the co-feature, light heavyweight Stipe Drews (32-1, 13 KO's) won a unanimous decision in 12 rounds against Silvio Branco (55-9-2, 34 KO's) to claim the light heavyweight title. OBERHAUSEN, Germany: Felix Sturm regained the WBA middleweight boxing title with a unanimous decision against Spanish veteran Javier Castillejo on Saturday. Sturm avenged being stopped by Castillejo nine months ago in the 10th round and losing the WBA belt. Also, Stipe Drews became the first world champion from Croatia when he took the WBA light heavyweight title from Italy's Silvio Branco with a unanimous decision. Sturm (27-2, 12 KOs) won his third title, having lost the WBO belt to Oscar De La Hoya on a disputed decision in 2004. Unlike the first fight against Castillejo, the German didn't let this bout turn into a brawl after leading on the cards. He was stunned by a shot to the liver in their first fight, then stopped by a series of uppercuts. "I think I showed I learned from my mistake - it's better to fight with your head," Sturm said. "I think I can stay champion a long time this time." The judges ruled the fight 116-112, 115-114 and 116-112. Castillejo (62-7 with 41 knockouts) chased Sturm the whole fight, throwing desperate flurries to the final seconds in a finish that brought 5,000 spectators to their feet. But even when he forced the close-in fight he wanted, he couldn't penetrate Sturm's defense or prevent getting tagged by the German's quick hands. Sturm had been considered a coming fighter after the De La Hoya performance, but the loss against Castillejo tarnished his image. "You can learn more from a loss like that in all my 26 wins before," Sturm said. Drews (32-1, 13 KOs) used his superior conditioning to take the final three rounds from Branco, and received judges' scores of 116-113, 116-112 and 115-113. He also beat Branco (55-9-2, 34 KOs) in a fight for the European title three years ago. Drews, known as "Spiderman" for his height, took control with some straight lefts in the fourth round, then ran into trouble in the sixth when Branco finally got in close enough to rock him several times. "The sixth and seventh round were very hard - after the eighth round his conditioning went down," Drews said. In a wild eighth, Drews ended up bleeding from the nose and Branco from a cut above the right eye. WBA lightweight champion Juan Diaz scored a technical knockout over Acelino Freitas after eight rounds of their unification bout in Connecticut. The Mexican, 23, won when Freitas, a four-time world champion and the WBO title-holder, failed to leave his corner at the start of the ninth round. Diaz raised his record to 32-0, with 16 of the wins by knockout. 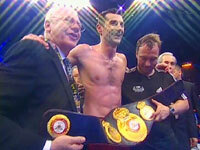 It was his sixth defence of the WBA belt. "He's a tough guy, a true warrior," Diaz said of Brazil's Freitas (38-2). In Oberhausen, Germany, WBA middleweight champion Felix Sturm gained revenge over Spain's Javier Castillejo with a unanimous points win. Castillejo (62-7, 41 KOs)caused an upset last July when he took the German's title with a 10th round stoppage after which Sturm was taken to hospital with a suspected broken jaw. This time, Sturm boxed cleverly and refused to be drawn into an out-and-out brawl, with the judges ruling the fight 116-112, 115-114 and 116-112. "I think I showed I learned from my mistake - it's better to fight with your head," said Sturm (27-2, 12 KOs) . "I think I can stay champion a long time this time." On the same bill, Croatia's Stipe Drews became the new WBA light heavyweight champion with unanimous points victory over Silvio Branco of Italy. Drews (32-1, 13 KOs) also beat Branco (55-9-2, 34 KOs) in a fight for the European title three years ago. Oberhausen Presser for the April 28 "Universum Champions Night"
on April 28 at the König Pilsener Arena in Oberhausen, Germany features the return of former world champion Felix Sturm (26-2, 12 KOs), who is attempting to regain his former world title against world champion Javier Castillejo (62-6, 41 KOs), the man who knocked him out to to seize the title in July 2006. "The first fight was already a great one but the second will be even better. Both of us will give everything! It was not so great with the defeat (to Castillejo) and the death of my mother," stated Sturm at a press conference today. "Without the support of my trainer Michael Timm and my friends at PLUS ONE in Cologne, Roland Beback and Clive Salz, this fight wouldn't be happening." "Now I feel fit as ever, have learned from and analyzed the mistakes in the fight against Castillejo and now know that talent alone is not sufficient....Castillejo is great boxer, a tough fighter. I'm glad about this great rematch. I will deliver the greatest fight of my career." World champion Castillejo is prepared for this. The Spaniard said:"Oberhausen is a nice place - it is great to be back in Germany as I have a special bond due to my childhood. The fight against Sturm will be as hard as the first one and I will get in to it the same way it did the first time. I will give everything!" In another world title fight, Universum fighter Stipe "Spiderman" Drews (31-1, 13 KOs) challenges WBA light heavyweight champion Silvio Branco (55-8-2, 34 KOs) out. Drews hopes to duplicate a 2003 win over Branco (W12) to claim his first world championship belt. "I have trained for this for over 6 months. I won't think back to the previous win over Branco.This is my first chance to become World Champion. It is a very important night for me and my home country of Croatia. They are hoping for the second croatian World Champion," the highly motivated "Spiderman" said in front of the press. Also, female featherweight champion Ina Menzer (16-0, 8 KOs) defends her world belt for the sixth time against Colombian Maria Andrea Miranda (7-1, 3 KOs). Miranda is known as "The Panther" as will be a tough challenge for Menzer. The 26 year old German is looking forward to step into the ring in Oberhausen, which is in short distance of her hometown of Mönchengladbach. "Miranda is always attacking and very aggressive. I'm happy to fight here as this is close to my hometown so my family and friends can come and support me!" The undercard is loaded with unbeaten WBC International cruiserweight champ Rudolf Kraj, WBO Intercontinental jr welterweight champion Willy Blain, middleweight Khoren Gevor and former WBO interim world champion Mario Veit seeing action in separate bouts. BOKS: STIPE DRVIŠ SVJETSKI PRVAK! Puljanin Stipe Drviš postao je svjetski prvak u poluteškoj kategoriji po WBA verziji. Hrvatski boksač je u Koenig Pilsner Areni u njemačkom Oberhausenu nakon 12 rundi jednoglasnom odlukom sudaca na bodove svladao Talijana Silvija Branca, preotevši mu tako naslov. Stipe je dosad dva puta bio europski prvak, no uvijek je napuštao tu titulu kako bi došao u priliku boriti se za svjetski naslov. Večeras je u Oberhausenu Stipe vodio veliku borbu s braniteljem naslova, bio je to dvoboj u kojemu su odlučivale nijanse. Drviš se do pete runde dobro držao, onda je malo posustao, da bi u samoj završnici ponovno preuzeo inicijativu i izborio ključne bodove. Drviš je pobijedio jednoglasnom odlukom sudaca (116:113, 116:112, 115:113) i tako postao treći hrvatski boksač s naslovom svjetskog prvaka u povijesti. Prije njega na vrhu svijeta bili su Ferdinand Živić (1940.) i Mate Parlov (1978.). Krenulo je dobro, a onda je on navalio u petoj rundi, pa sam ga pustio da se ispuca. To je bila moja taktika, on se umorio, a da mi nije zadao udarac. On je iznimno iskusan borac, ali sam znao da će završnica biti moja, imao sam više snage i bio sam uvjeren u pobjedu. Kod mene je uvijek važan umjetnički dojam, rekao je Stipe Drviš, koga je u Oberhausenu bodrila čitava obitelj. Drviš (34) je već jednom, u Berlinu 2003. godine, porazio sedam godina starijeg Talijana, no ovaj put je u Oberhausenu ulog bio pojas svjetskog prvaka, kojega je Puljanin posve zaslužio. Bolje je Drviš boksao u prve četiri runde, zatim proživljavao malu krizu u petoj, šestoj i sedmoj rundi, kada je dopustio iskusnom Talijanu da mu dođe preblizu. Stipe je povratio snagu i udarce u devetoj i desetoj rundi, a borbu je u zadnje dvije runde okončio furiozno, plešući oko Branca i udarajući ga, a da pritom nije primio nijedan udarac. Bila je to najveća pobjeda Stipe Drviša u karijeri, u kojoj je od 33 borbe izgubio samo jednom, u Australiji od Paula Briggsa, dok je Branco doživio deveti poraz u 67. borbi, koja će mu najvjerovatnije biti i posljednja. Osim Živića, Parlova i Drviša, koji su osvajali pojas svjetskog prvaka, još su se samo petorica hrvatskih boksača borila za naslov - George Chuvalo daleke 1966. godine kada je izgubio od Muhammada Alia, Marijan Beneš (1980. ), Renato Cornett (1993. ), Branko Šobot (1998.) i Željko Mavrović, koji je prije devet godina izgubio u borbi sa Britancem Lennoxom Lewisom. Outstanding article. As a boxing fan it is nice to resd of current events. Thank you for your effort to bring us the news.